A tarot reading is just one type of reading that gives insight into your life. Different psychic readings can help you in different situations. 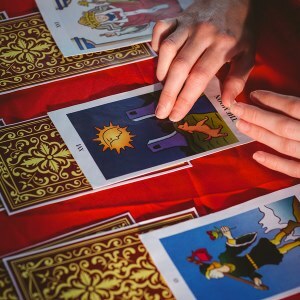 Whether you need to make sense of your past, gain insight into your future, or work out details about your current situation, a psychic reading is a great tool for moving forward. Many times, we're unable to move toward the future because our current lives are too confusing or overwhelming. An intuitive is the perfect person to turn to in these cases. An intuitive counselor can help you make sense of your current situation. This, in turn, allows you to move toward a better future. A medical intuitive is someone who specializes in issues about your health or physical state when these issues have an energetic cause. Tarot cards can answer a specific question or interpret your past, present, and future. A tarot reader shuffles the 78-card deck to lay them out in a spread, which can be a single card or multiple cards interpreted together. It's up to the reader to interpret the cards for the person receiving the reading. Each card and card combination has its own meaning. Each reader may use a different deck or spread, depending on their preference. Each deck has two sections: The 22-card Major Arcana shows your path throughout your life, while the 56-card Minor Arcana deals with people you might meet and other life situations. Don't fall into the common trap of believing an astrological reading should apply to everyone of a given sign. It's much more specific than that! Getting an astrology reading online is ideal when timing is very important to you. Examining the place and time of when you were born, a chart reveals the potentials and energies you've had from birth. An astrologer compares the positions of the planets from where they were at your birth with where they are now. This allows astrologers to predict the current trends in your life. It's a great tool for figuring out when it's a good time to take an action or wait to make a future move. By looking at how the stars and planets aligned at the time of your birth, an astrologer can give you predictions and advice for situations, events, and issues you'll face. If you're looking for a way to make better choices in your life, a numerologist might be just what you need. Numerology studies numbers and how they apply to someone's life. Because of this, a numerologist can use numbers and symbolism to find out what your weaknesses and strengths are and use that to guide you to better decision-making. A numerologist studies numbers in a variety of ways. They can look at the name you were given at birth or the name you use now, or they can use your birthdate. Much like how astrology examines the shifting of the planets, numerology uses the shifts in numbers to uncover insights into your future. Different types of psychic readings are ideal in different situations. Find the best kind to work through your needs.